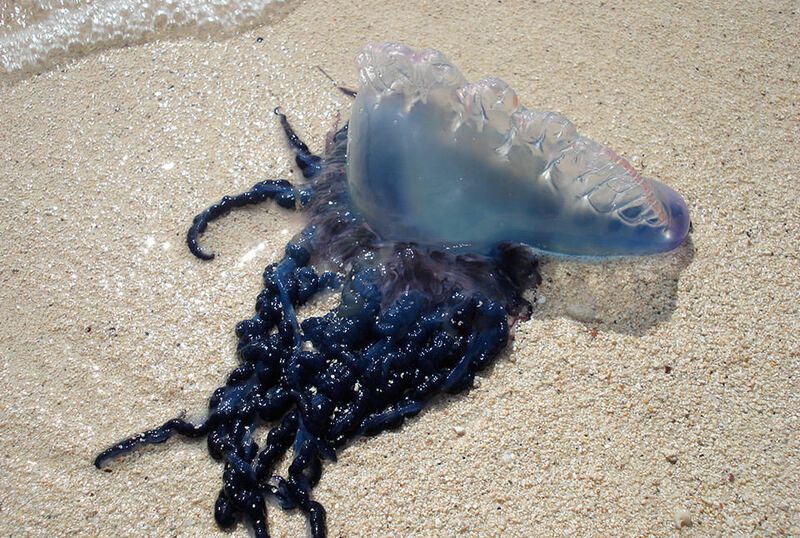 Home Ocean Facts What is a Portuguese Man o’ War? The Man o’ War is a species of siphonophore, a group of animals that are closely related to jellyfish. The Portuguese man o’ war, (Physalia physalis) is often called a jellyfish, but is actually a species of siphonophore, a group of animals that are closely related to jellyfish. A siphonophore is unusual in that it is comprised of a colony of specialized, genetically identical individuals called zooids — clones — with various forms and functions, all working together as one. Each of the four specialized parts of a man o’ war is responsible for a specific task, such as floating, capturing prey, feeding, and reproduction. Found mostly in tropical and subtropical seas, men o' war are propelled by winds and ocean currents alone, and sometimes float in legions of 1,000 or more! Resembling an 18th-century Portuguese warship under full sail, the man o’ war is recognized by its balloon-like float, which may be blue, violet, or pink and rises up to six inches above the waterline. Lurking below the float are long strands of tentacles and polyps that grow to an average of 30 feet and may extend by as much as 100 feet. The tentacles contain stinging nematocysts, microscopic capsules loaded with coiled, barbed tubes that deliver venom capable of paralyzing and killing small fish and crustaceans. While the man o’ war’s sting is rarely deadly to people, it packs a painful punch and causes welts on exposed skin. Beachcombers be warned: The stalwart man o’ war may still sting you even weeks after having washed ashore.